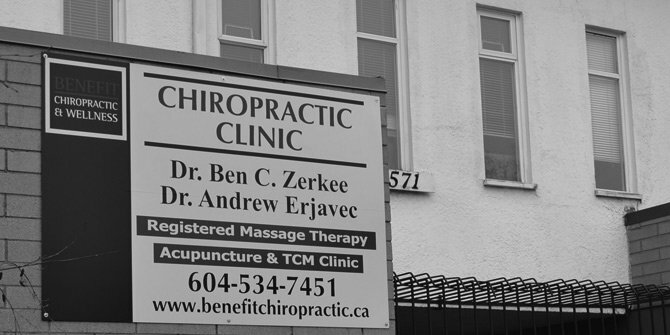 Benefit Chiropractic & Wellness chiropractors, Dr. Ben Zerkee and Dr Andrew Erjavec offer chiropractic and wellness services to family members of all ages in the Langley community. Chiropractic care may be a benefit to children, teens, adults, and seniors for their injuries or as a part of their overall health and wellness. Injuries that may respond well to chiropractic treatment can be sustained from childhood falls, sporting activities, lifting, twisting and bending, repetitive movements and even issues with proper posture. In addition, chiropractic treatments can be a part of a healthy active lifestyle. Regular chiropractic care helps keep your body flexible and mobile, and therefore may enhance activity performance and reduce the chance of injury. Our aim as chiropractors is to help patients recover from their injuries, prevent additional injury, and to attain an active healthy lifestyle. We treat the whole person at Benefit Chiropractic & Wellness and offer registered massage therapy services for our clients. Massage has many benefits, including pain relief, stress reduction, wellness promotion and more. Our acupuncturist offers not only acupuncture services, but takes a comprehensive approach to your health including TCM herbs, acupressure, moxibustion and diet therapy. Your insurance plan may cover acupuncture. Our feet get us everywhere we need to go, and custom orthotics can help relieve for foot pain. Benefit Chiropractic & Wellness is located in Langley, BC, and offers a variety of chiropractic and health services for family members of all ages. The office is to be found in the heart of downtown Langley City on Douglas Crescent, adjacent to the one-way Fraser Highway shopping district. We are situated directly across the street from the Douglas Recreation Centre and Douglas Park. We understand that pain and accidental injury don’t make reservations. Often new and regular patients alike are in dire pain when they call for an appointment. At Benefit Chiropractic & Wellness, we do everything we can to accommodate you as quickly as possible. Benefit chiropractic office is a family health clinic, offering chiropractic, registered massage therapy, and acupuncture services. In addition, other health related products such as custom-made orthotics and pillows are also available. Our focus is not only to take care of your immediate injury needs, but also to help prevent further injury and enhance your health and overall quality of life. For all your Chiropractic needs in Langely, Surrey, Aldergrove, and Abbotsford, Call Benefit Chiropractic & Wellness, located in downtown Langley BC.